This class provides a systematic approach to the practice of traditional yoga. Each student will gradually work on developing strength, flexibility, proper breathing habits, concentration and relaxation at their own pace. Taught in a gentle and traditional manner, this class is an excellent way to start learning and practicing yoga. It is suitable for complete beginners or more advanced practitioners who are ready to take the basic postures to the next level. Ideal for people of all ages and fitness levels. With one-on-one instruction, the student receives a very specific and comprehensive yoga training program suited for their individual needs. Incorporating the teachings of a yogic lifestyle, each personal program will include a routine of poses modified to the client’s physical potential, proper breathing techniques, guidance in positive thinking and meditation plus learning what makes up the yogic diet of clean eating. Rent the Room or the Class! Bring your event to the NJY studio or have Angela join your party to teach a specialize yoga class for your particular group. 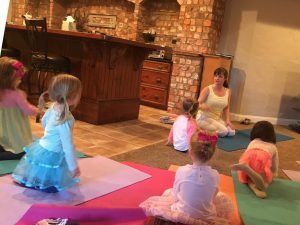 Whether it’s a group of toddler or preschoolers, bridal party, pregnancy yoga for a baby shower or a corporate function that needs a focusing and strengthening class, Angela can develop a personalize class for your unique group. NJY is a lovely 900 sq ft space that can easily accommodate groups of 25-30 people. The room is equipped with mats, pillows, blankets, chairs and a table for party favors, a cake or refreshments. This free class combines group support, gentle yoga postures, breathing and relaxation practices to help relieve stress and encourage healing. Each student works at their own pace while comfortably seated in a chair. All patients currently or previously in treatment and their support persons are welcome. 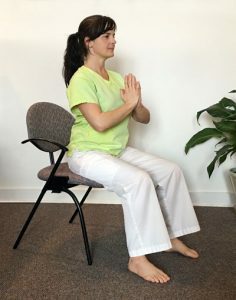 Private one-on-one yoga classes for patients with cancer are supported through the Novant Integrative Medicine Department at the Forsyth Medical Derrick L. Davis Cancer Center. $50 per session with Angela. Please contact Margaret at 336.277.6000 to schedule an appointment at the Forsyth Medical Center Oncology Yoga Facility. This one hour class is designed specifically for the mother to be. Each class is modified to the needs of the expectant mom, whether it is learning positions and breathing for labor, or poses to help alleviate back pain, reflux or swollen feet. The gentle and relaxing yoga postures are suitable for any fitness level or stage of pregnancy. Every class ends with a long relaxation allowing for the release of any built up stress from the day. Practicing yoga with baby is a wonderful way to enjoy your baby’s first year. Babies are incorporated into the yoga poses and each class ends with a massage for baby. Please join us for this free New Mom’s Group, at 11:30 immediately after Mommy & Baby Yoga on the first and third Thursday of each month. Forsyth Medical Center Lactation and Baby Specialists will join us for an hour long question and answer session to support all new mothers. During this two-hour workshop new moms will learn yoga poses and exercises to help align, balance and restore key muscles allowing for optimal recovery of your abdominal and pelvic floor muscles helping to avoid back pain and bladder control issues that so often affect new mothers. Participants will also learn several easy 10 minute yoga routines to maintain flexibility and fitness that can easily fit into a busy moms schedule.